Bitter~Sweet ™: Where did these cookbooks come from?? The fact that light snow is falling as I type this is a brutal reminder that spring has not yet arrived. The only shred of a silver lining I can find is that if it isn't spring, then I don't have to start my Spring Cleaning!! I have, however, begun to tackle some Pre-Spring Cleaning. You know, working on that clutter that creeps in and needs to be sorted, weeded and reorganized. 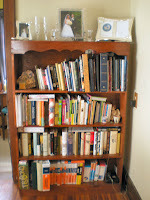 First up are the bookcases, which tend to become overstuffed pretty quickly. I worked on bookcase #1 yesterday. The second shelf down is dedicated to my cookbooks. I like to cook and bake, so I'm not surprised that a single shelf no longer contains my collection. 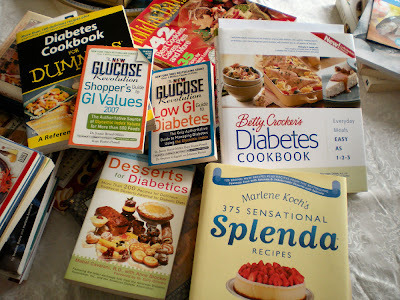 What did surprise me was how many "diabetic cookbooks" I've acquired. You see, I don't really believe in cooking "special" foods for Type 1 diabetes. The bolus options on my pump do a pretty good job of accommodating what I eat. 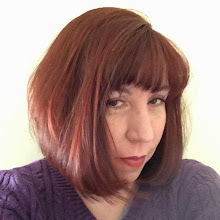 Of course, I do believe in healthy eating and all things in moderation for those with diabetes or without (even if I don't always practice these beliefs). But cooking special dishes, especially desserts, which are a sad knock-off of the "real thing"? I don't really see the point. In my experience, the knock-off is somewhat nasty and just leaves me wanting to indulge in the real thing anyway. In the end, a couple of my diabetes cookbooks did make their way back onto my book shelf. I kept the Splenda book, which I have used and which does have some really good recipes. I like the ones that use real sugar along with Splenda (which I sometimes swap out for Stevia). I also kept some of the Low GI books, because my post-meal spike is smaller and easier to control with foods that are lower on the Glycemic Index. The rest of the books were donated to our local library's book sale. I know I haven't used those and probably never will - but someone else might enjoy them. 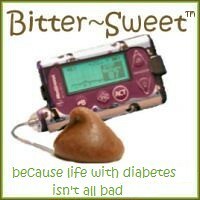 What are your thoughts on diabetic cooking? Do you own any Diabetes Cookbooks? Do you use them? I have a collection of diabetic ones, too - they often have healthier recipes in a general sense (less fat, less sodium, etc.) and I'm happy to do healthier! I generally avoid any recipes that call for replacement stuff. You hit it on the head when you said "sad knock-off." My view of a good Type 1 diabetic cookbook would be one that broke down the carbs for you in a meaningful way (like weight as you see on nutritional labels) and one that gave lovely bolus and extended bolus tips. I realize that second part is a pipe dream since everyone is different, but a girl can dream, right? I have tons of cookbooks, you'd think I was a great cook; I'm not. Whenever I look at a new recipe, I look to see if they have the nutritional info these days. I agree with the other comments. . . I'd rather a "diabetic cookbook" just give me a thorough and accurate breakdown of the carbs and other nutritional info involved in the dish. In ever other way I'd rather just cook yummy, healthy dishes rather than just focus on a way to make things "diabetes friendly." I kinda feel like those books must be more geared toward Type 2's whose management doesn't require insulin and instead have to adhere to a particular diet. I remember back in the days before carb counting when everything had to be weighed and everything you ate was set on a specific dose of insulin you took and there was NO freedom.